"Following Jesus together, leading others to HIM"
Grace is a small, vibrant, caring congregation of Lutheran Christians in Atlanta, Georgia, located in the Virginia Highland and Morningside neighborhoods, east of downtown Atlanta. 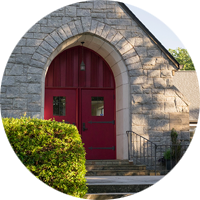 Established in 1922, Grace is one of the oldest Lutheran congregations in Georgia. Considered the mother church of Missouri Synod Lutherans in Atlanta, 14 of the area congregations were born out of Grace’s commitment to the mission of Jesus Christ to make disciples of all nations. Today, Grace continues to be energized and directed by its historic commitment to Christ’s commission to make disciples. As a community of God’s disciples, Grace Lutheran Church is called to lead people to Jesus that together we may follow him through death and into resurrected life, beginning now and for eternity. Looking for a friendly church to call home? Share in worship with us on Sunday mornings at 11:00 am. Holy Communion is celebrated every 1st and 3rd Sunday of the month. Community events are popular at Grace and include social outings to our favorite local restaurants and festivals to fundraising events where we join together as a team for a great cause. Join us!